A Guide to A Homeowners Septic System Manual | GPR, Inc. The following is intended to assist homeowners in understanding the general function and maintenance of a septic system. It is not intended to be a through explanation of or maintenance manual for all septic systems. It is strongly recommended that homeowners hired an experienced professional when performing any review or maintenance on a septic system. 310 CMR 15 – The State Environmental Code, (Title 5) are the regulations that govern the design and use of septic systems in Massachusetts. Local municipal health departments are responsible for enforcing those regulations. Many municipalities have local by-laws or ordinances that also regulate the design and use of septic systems. Certain septic systems, such as Innovative/Alternative (I/A) systems, approved by the Massachusetts Department of Environmental Protection (DEP) require deed riders and have other more specific maintenance and use requirements. If your system is one of these, you should read and understand the requirements of that system. · It reduces the velocity of sewage entering the tank and allows it to become static. · Removal of solids by settlling and floatation.Between 60% and 80% of solids are removed in the septic tank. · It provides anaerobic digestion of solids. BOD (Biological Oxigen Demand) of the sewage is reduced by 30% and 50%. 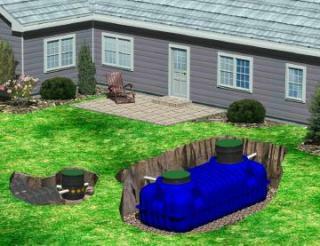 There are three layers within a properly operating septic tank. · Scum layer. The scum layer floats on top of the effluent and contains fats, oils and proteins from within the sewage. · Effluent layer. The effluent layer, also called grey water, contains liquid that has been separated from the scum and solids. This layer is what flows out to the absorption field. · Soilds or sludge layer. This layer contains solids that have settled out of the sewage to the bottom of the tank. · Frequency of pumping. Too many solids in the tank may allow some solids to flow out to the absorption field. · Hydraulic overloading. High volumes of water over a short period reduce the settling time for the solids allowing more solids to remain in suspension, resulting in solids flowing out to the absorption field. Leaking plumbing or openings in the building sewer which allow groundwater to enter the system also can create hydraulic overloads. See absorption field below. Typically, the absorption field or leaching field is a series of pipes that release the effluent below ground so that it can infiltrate into the soil. Aerobic bacteria form a “bio-mat” that digests more solids and “cleans” the effluent. The effluent is then filtered and further “cleaned” by the soil before entering the groundwater. This is referred to as secondary treatment. In a properly operating system, the bio-mat is slimey and extends into the soil and is aerobic and permeable. In a failing system, the bio-mat is thick, gelatanous and usually only grows within the pipe. This bio-mat is often anaerobic and is impermeable. · Solids by-passing the septic tank. Solids that by-pass the septic tank can buildup faster than bacteria can digest them. This can create a layer of solids that prevent absorption of the effluent into the soil. · Hydraulic overloading. As mentioned above, hydraulic overloading – using too much water over a short period of time or constant flow of water can simply overload the absorption field to a point where the effluent does not infiltrate into the soil fast enough and the overload “breaks out”. A break out is water coming out of the ground, usually seen along a slope area near the absorption field or sometimes puddling on top of the field. · Flushing of anything other than human wastes. Do not flushing anything other than human waste into a septic system. · Improper venting. Absorption fields must be vented. Typically, residential absorption field are vented through the piping back into the dwelling up the main plumbing vent stack and through the roof. Venting also occurs through the soil. Therefore, absorption fields that are beneath paved areas must have separate vent pipes attached. These vent pipes, often referred to a “candy canes” must be kept free of obstructions. Improper venting can cause the bacteria in the absorption field to die and become an impervious layer in the soil preventing absorption and proper functioning of the field. Knowing and understanding how a septic system works is important to keeping it working properly. A septic system is intended to treat and dispose of human waste products only. It does so through biological action. All other substances can negatively effect its operation. The following are general tips for prolonging the life of a residential septic system. 1. Have your tank inspected every year. Per Title 5, septic tanks should be pumped when the solids or sludge layer is within twelve (12”) inches of the outlet tee invert, or when the scum is within two (2”) inches of the top of the outlet tee. Since pumping is a direct function of use, pumping may not be required every year. Normally, pumping every two to three years is adequate. Make sure the pumper submits a record of the pumping to the local board of health and keep a copy for your records. 2. Have the pumper clean the effluent tee filter located in the septic tank every year. Effluent tee filters prevent soilds from leaving the septic tank. Clogged or broken effluent tee filters can allow solids to enter the absorption field. If your septic tank doesn’t have an effluent tee filter, ask a professional to install one. 3. Know where your septic system is located so that you can visually notice changes to the appearance on the surface. 4. Do not use a garbage disposal! Disposals contribute to the accumulation of solids. Title 5 requires systems with garbarge disposals to have larger septic tanks and larger absorption fields. 5. Do not plant trees or shrubs on or around the septic tank or absorption field. The plants will block the sun light, reducing the evaporation potential and the roots can damage the absorption field and tank. 6. Do plant grass on the absorption field. Grassy vegetation helps the soil absorb water. 7. Do not dispose of hazardous chemicals down your drain, especially: pesticides; paints; gas; oil; chemical drain cleaners, etc. All of these substances can affect the function of a septic system. Note: Latex paint can form a film over the soil preventing the proper absorption of the effluent into the soil. 8. Do not dispose of cooking grease down your drain. In liquid form, grease flows through a septic tank and when it solidifies it can affect the absortion field. 9. Do not dispose of medications (especially anti-biotics as they kill the “good” bacteria) down your drain. 10. Limit the amount of bleach and strong disinfectants (both kill “good” bacteria. 11. Do not flush sanitary pads, tampons, diapers (regardless if they are supposed to be flushable) cigarettes, or other small objects. 12. Do not flush kitty litter or pet “wee wee” pads. 13. Do not connect water softener, swimming pool or other backflush systems to the septic system. 14. Schedule laundry loads evenly throughout the week. Try not to do all of the laundry in one day. Large amount of water can cause hydraulic overloading. Note: Septic systems can recover from large gatherings of people that only occur a few times a year. However, repeated hydraulic overloading can be harmful to a septic system. 15. Use low or no phosphate, low sudsing laundry detergents. Phosphates encourage the growth of algea, which depletes the oxygen in the water effecting aerobic bacteria growth. 16. Use liquid laundry detergents. Powdered detergents contain non-biodegradable materials that do not dissolve completely and can affect the absorption field. 1. Install efficient, low flow toilets, faucets and shower heads. 2. Fix leaky faucets and showers. 3. Fix toilets that run continuously. 4. Do not allow roof gutters to drain into, on or near the septic system. 18. Do not park cars or heavy equipment on the tank or absorption field. This compresses the soil and reduces absorption and venting. 19. Do not use additives. Old wives tales suggest all kinds of additives like yeast and peroxide. Yeast and peroxide, while harmless are not necessary for the proper functioning of a septic system. DEP publishes a list of approved additives, but does not endorse any additive. The approval is simply a determination that the additive will not harm a septic system. 20. If you think there is a problem with your septic system, give us a call at 978-772-1590 to see how we can help!